This means editing the English versions of the i18n messages for notifications and adding <b>...</b> in a bunch of places. @Pginer-WMF, @jmatazzoni: Thoughts as to whether this should be applied to user names as well? 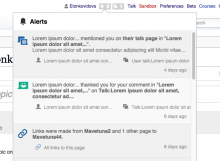 We're planning to move user names out of the notification message in some cases (e.g. user-rights) but not all (e.g. edit-thank). Should use ''', right, rather than <b>? Yeah, you're right, these messages are wikitext. I think the main priority for bolding should be content. That is what I'd expect users to scan the notifications for. 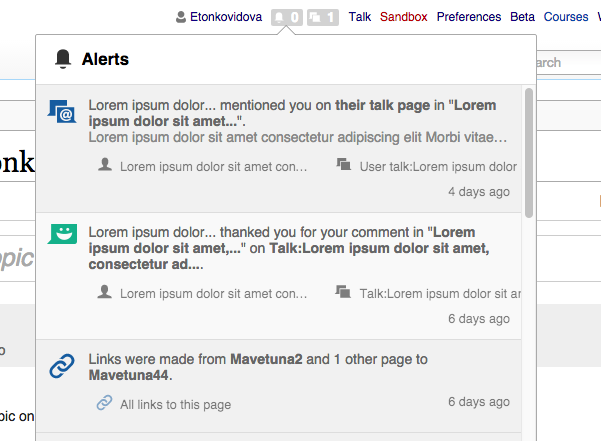 So I'm more inclined to use it for pages and notification-specific content (such as topics in the case of Flow). Ideally, we should aim for having just one bolded element per notification in order to keep bolding effective (i.e., get the gist of the info by just looking at the icon and bolded element). Having said that, delimiting long user names may be problematic (T121822), so we may to reconsider the bolding of usernames for that purpose. I thought we were going to use a convention of bold for board titles, and quotes (but not bold) for topics. This seems to be done in M132 . The initial idea is to bold the pages. 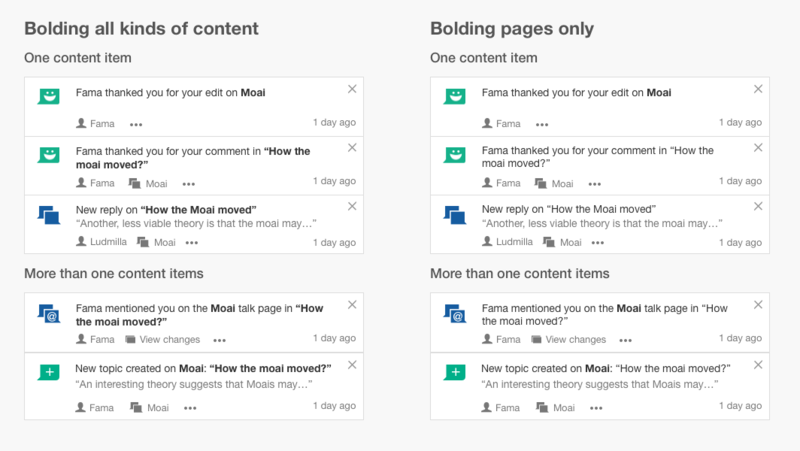 I was exploring the option of bolding also content such as the topic titles since it could help to find content (e.g., looking for the activity about "How the Moai moved?" across different notifications in the examples above). This obviously comes at a price: the more elements you make bold, the less effective bold is. Although for the case of bolding topics and pages, most of the notifications still keep just one element in bold. So the feedback I'm looking for is: at which point in the examples above the bold starts becoming annoying or of little help to quickly process and understand notifications? In addition to avoiding over-bolding, it could be helpful to use bolding to help people distinguish between boards and topics. Emphasizing topics another way (e.g. italics) could help with that, but I'm not sure if that would actually be good UX. I'm fine with bolding either or both types of content -- pages and topics. I think I like bold for both, though not by a lot. But I'd draw the line at users, who already get an icon and their names repeated in the secondary links. So I think there's enough emphasis for users already. I'm fine with bolding either or both types of content -- pages and topics. I think that the benefits are more valuable that the potential drawbacks. 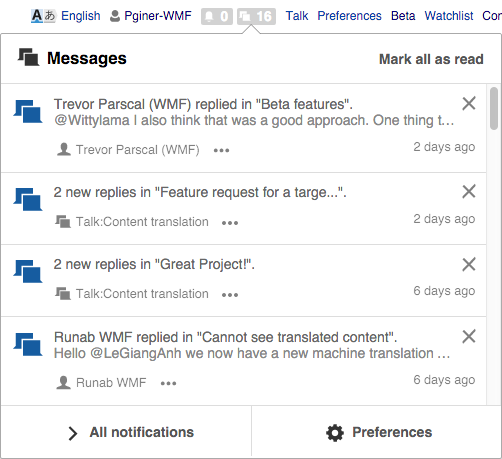 For notifications with topics as the main item (e.g., thanks and replies), it helps to identify what the notification is about. For notifications with more than one bolded element, the distinction between elements seems clear enough (having the topic in quotes also helps). Should we treat wikitext section names the same as topic titles, with quotes and bolding? Yes. It makes sense to keep the formatting of discussion notifications consistent regardless of those happening on a Flow or Wikitext page. We said before that the string "you talk page" would be bold because it is not exactly a page name but it acts like it, right? What about: User1 mentioned you on the talk page of User2 in "section name". Should "talk page of User2" be bold here? @jmatazzoni, @Pginer-WMF Did we conclude that we would bold page titles but not topic titles or section names for now? I expressed in T121724#1993831 my preference for going with bolding the main pieces of content (pages, topic titles, section names, and indirect references to them such as "your talk page"). For the topic and section names they will be in quotes also, helping to differentiate them from page names. I think this addresses one concern from Matt, but I don't see in the ticket anyone expressing further objection so far (if anyone has, please do). I was about to say sure, let's go with bold on Pau's argument that we don't have many instances where a pagename and topic name will be in the same message. But then Pau's comment about bolding all the other "main pieces of content" caught my eye. Of those, we know that the ones in boldface are among the most common notifications, on some wikis anyway. So, as so often, we must balance clashing goals/principles. On one hand, BF can make information stand out. On the other, when emphasis is overused, it loses its effect and can, in fact, degrade overall readability. It's hard for me to to know just what a representative Notificaitons panel or page will include, but when I look at the examples on Test I see a lot going on--multiple icons, colors, font styles... @Pginer-WMF, you've looked at this harder than anyone else. With the information above, do you still think we should boldface all content types? Anyone else? I could go either way. Groups. They are not affected, the user is. Tags. They are not affected, the page is. 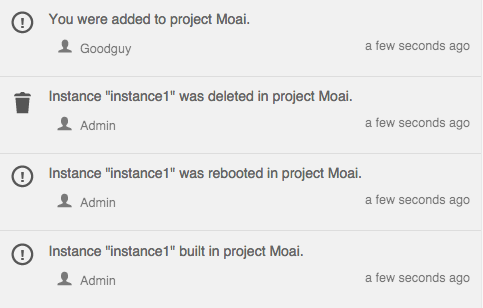 Projects/Instances: they seem to go together but I don't have enough info on the specific notifications. With the above consideration we avoid the sequences of bold items (tags, and groups) which could lead to having more than two pieces of information bolded. If we want to have a more clear definition that we can generalise in the guidelines for others to apply, we can start by bolding just pages and topics for now since those are the elements used in the projects we work more directly with. I'm not worried about those with two elements of the same type: renaming a page (or a topic) it makes sense to highlight both in the same way since those are the elements you want to compare. For the case of pages, we were already comfortable with that approach. In some cases we can focus the communication more on the main item. For mentions, we considered the option to make it similar to Flow-mentions where the topic will be the only main element in the copy and the page will be shown as a secondary action. Regarding frequency it is also hard to anticipate the effects. If you get many notifications about the same page but on different topics it may be helpful to better distinguish the different topics. 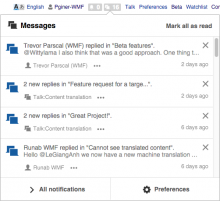 Below is a screenshot of my messages in MW.org, most of them are replies and having the topics in bold would have helped to differentiate them. I will copy this information to the ticket description.